When wiring for a dishwasher its just three wires, but there are two ways to wire it. Hard wire it directly to the breaker box(if you hard-wire directly leave about 5 extra feet of cord behind the dishwasher so it can pulled out of the cabinet area to be serviced or replaced) or using a dishwasher cord . If you have to supply the electric for the dishwasher it has to be on a 20amp breaker in the breaker box, and 12-2 rated wire should be used. Do Not Use 14-2 wire for a dishwasher or any other 20 amp circuit, 14-2 wire is rated for 15amps. . And if you install a outlet it should be a GFI(ground Fault Intercepter) outlet. The water, drain, and electric connections are on the bottom of the dishwasher. When installing a dishwasher you will need a few parts, you will need what is known as a "dishwasher ninty", drain hose, and a water supply line. I recommend using a braided water supply line to supply the water because they are easier to install. Though braided water supply lines do not last as long as the copper tubing supply line, they will outlast the dishwasher. 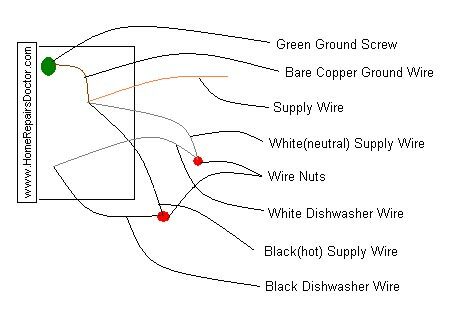 The dishwasher wiring diagram below will use the same configuration for using a dishwasher cord or hard-wiring it directly to the breaker box. Prepare the wires for connecting them together by striping the plastic down from the ends a half inch. Connect the black (hot) wire from the dishwasher to the black(hot) supply wire, install wire nuts to cap off the exposed wire ends. Connect the white(neutral) wire from the dishwasher to the white supply wire, install wire nuts to cap off exposed ends. And for the ground wire simply connect it to grounding screw located on the junction box.